Could a better understanding of etiquette have prevented the Enron scandal? Well, lying to shareholders never constituted good manners in anyone's book, nor good business sense, so perhaps. Drawing such lines is what the Posts attempt in the early chapters of this updated version of their business etiquette book, where they equate good ethics with good business. But really, is the slope between saying that the boss is in a meeting (when he's not) and distorting P&L statements actually that slippery? 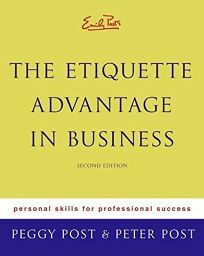 In trying to suggest that it is, the early chapters of this book provide little helpful guidance on actionable business conduct and come dangerously close to mimicking an employee handbook. Once the authors leave behind the discussion of ethics, cubicle etiquette and general office building conduct-please, no singing to your iPod in the elevator-one finds the content one expects from the Posts, like a mini-course in wine selection, pointers on making small talk with anyone, tips for trouble-free business travel and modern-day rules for handshaking. (FYI, it's no longer gender-specific, and women should always extend a hand, even if wearing glamorous evening gloves.) Ultimately, such social tips are more useful than the Posts' advice to tell your boss that lying about his whereabouts makes you uncomfortable. The authors also include substantial content on conducting a well-mannered job search.